3GP format is not accepted by Apple devices like iPhone iPad iPod, and many other media players, for example, Windows Media Player. What's more, 3GP is not the best format for uploads on YouTube, Facebook etc social networking websites. Here we share a detailed guide to quickly convert 3GP to MP4 format, one of the most popular formats with great compatibility and good balance between file size and quality. For users who want to get the best quality of MP4 from 3GP in a fast speed, without further ado, MacX Video Converter Pro (Windows Version) comes to the rescue. The tool empowers you to convert 3GP to MP4 in less time but higher quality compared with other free converters like Handbrake, FFmpeg, due to its improved HT tech, hardware encoding tech, Multi-core CPU processing and well built-in High Quality Engine. 1. HQ engine, Multi-core CPU, QSV acceleration tech promises lossless video conversion and 5x faster speed than other free video converters. 2. 400+ preset profiles for mainstream devices are available when changing 3GP video to MP4, including iPhone 7, Galaxy S7, smart TV etc. 3. Edit videos before converting. The software enables users to add subtitles to MP4, trim/crop, add watermark, repair corrupted videos, adjust video bitrate, frame rate, audio bit rate/channels and other video audio parameters etc. 4. Built in 370+ video audio codecs, the tool can convert among HD/SD videos, such as MP4 to Webm, WMV to MOV, AVI to MP4, MKV to MP4, FLV to MOV, etc. 5. The 3GP converter can download 3GP videos and other formatted videos from YouTube, Vimeo, Facebook 300+ sites in a click. Step 1: Free download the converter for Windows or for Mac if you haven't and run it. Click "Add File" and select 3GP files to convert. Or you can load 3GP files by simple drag-n-drop. Batch conversion is supported. Step 2: Choose MP4 as output format from the popping up Output Profile window. Select PC general video and "MP4 Video" and click "Done". The software offers various video and audio options on the "Settings" catalogue, like video codec, bit rate, frame rate, resolution, aspect ratio, audio channel etc. Click "Edit", you can trim, crop videos and add subtitles to the video before conversion. Step 3: Click "Browse" to select destination folder to save converted file and hit "RUN" button to process 3GP videos to MP4 format with the best video converter. What is 3GP: 3GP (3GPP file format) is a multimedia container format that is designed as an implementation of MPEG-4 compression for faster data transferring speed on 3G network mobile phones. iPhone iPad etc. iDevices used to support to play 3GP file. Some newer phones also support to play and record 3GP file but with limitations. But compared with MP4 container format, 3GP format comes with a lot of disadvantages, and 3GP only shows its strengths on some 3G network phones. 3GP vs MP4 - 3GP Advantages and Disadvantages: 3GP format is specialized for 3G network mobile phones. It always has small file size, which enables us to stream media on low bandwidth with little demand on storage space and transferring speed. However, the big disadvantage of 3GP format is that it has low resolution and low frame and worse compatibility. MP4 is almost supported by any media player and smart phone, while 3GP format is unaccepted by Apple iPhone, iPad, iTunes, Windows Media Player etc, requiring to convert 3GP to MP4 using MP4 converter for smooth playback. Gone are the days when 3G network dominated, and 3GP is an outdated format now, few people choose to convert video to 3GP. How to Play 3GP Files: 3GP is playable on 3G network mobile phones. If you phones, PSP or iPhone iPad etc. cannot play 3GP files, convert the 3GP files to MP4 format or other friendly format for your mobile devices. To play 3GP on Mac/Windows, select media player that supports 3GP playback. Popular media players that accept 3GP include VLC, QuickTime Player, MPlayer, SMPlayer, 5KPlayer, to name a few. 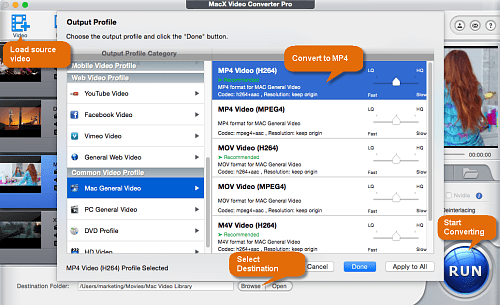 Free download the best 3GP to MP4 video converter - MacX Video Converter Pro to quickly convert 3GP videos to MP4 or other formats on macOS and Windows with original quality reserved in 5x faster speed than other free converters such as FFmpeg.